Auschwitz Birkenau - German Nazi Concentration and Extermination Camp (1940-1945) was the principal and largest of the concentration camps that were erected by Nazi Germany for the Final Solution. Located in southern Poland, it took its name from the nearby town of Oświęcim (Auschwitz in German). Auschwitz I, the original concentration camp, served as the administrative center for the whole complex, and was the site of the deaths of roughly 70,000 people, mostly Poles and Soviet prisoners of war. Auschwitz II (Birkenau) was an extermination camp or Vernichtungslager, and was the site of the deaths of at least 960,000 Jews, 75,000 Poles, and some 19,000 Roma (Gypsies). 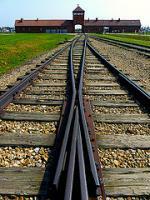 Birkenau was the largest of all the Nazi extermination camps. Hardly two weeks after the WHC meeting of 2015 that gave me no less than 9 'new' sites, I hit the road again for my 580th WHS. The start of daily KLM flights to Cracow drew me to a revisit of Southern Poland. I had been to Cracow in 2005, visiting the Old Town, the Wieliczka Salt Mine and Kalwaria Zebrzydowska. 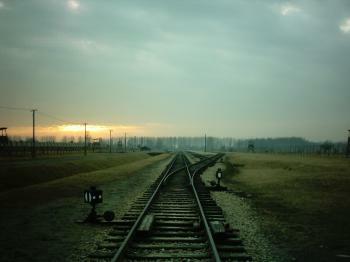 At that time I decided to skip Auschwitz, as I wasn’t really in the mood for what I knew would be a very moving visit. 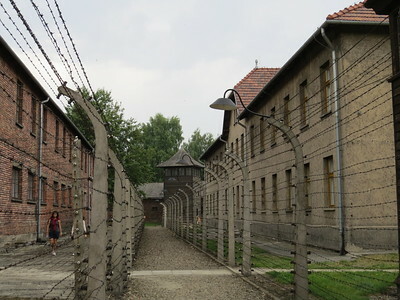 This time around I started with Auschwitz Birkenau, staying overnight in Oswiecim. I had reserved entry for 8 a.m. on Saturday morning. Visitor numbers are limited to 100-200 an hour depending on the hour, so it’s best to pre-book a spot. Later in the day places fill up quickly, as after 10 a.m. these include guided tours in German, English, Russian, Spanish or Polish. When I arrived at about 7.50, already some 100 people were queuing to get in. The doors do not open until 8 a.m., and then you have to pass security first. You’re allowed to bring in hardly nothing, and I even was turned away on my first try because of my tiny backpack! So bring only a camera. Or an umbrella. Or nothing. Auschwitz I Camp lies in the urban area of the Polish town of Oswiecim, it really isn’t on the outskirts as it is sometimes described. Its very urban setting came as a surprise to me. And also its looks: it reminded me of those 19th century company towns, with neat rows of brick buildings. This was the administrative center of the Auschwitz Camp system , and it had offices and hospitals. Behind closed doors terrible things happened of course, and sometimes even in plain sight as with the public hanging of prisoners (which were mostly Polish and Russians incarcerated here). Most of the buildings now contain exhibition rooms, telling about different aspects of the camp and the fate of prisoners from various nations. Auschwitz II or Birkenau lies 3 km away, in a rural area. This was the largest extermination camp of the Nazi’s, which could house 100,000 prisoners at the time. Over one million people were killed here, in what was like an industrialized process. Its 175 hectare terrain held more than 300 brick and wooden buildings, of which 67 are still intact. It's a long walk to cross the terrain, but it does give you a sense of the scale of this camp. The barracks lie in long rows next to the main track and the railway. Most are not accessible and located behind barbed wire. At the very end there are the collapsed gas chambers, which were blown up at the end of the war by the SS to cover up their actions. In the woods behind it still stands the building where the prisoners were ‘introduced’ to the camp, and were stripped of their possessions and clothing. This ’dehumanization’ is again presented soberly (mostly bare spaces with an information sign), but I found it the most moving part of my visit. Besides the enormous size of it all, it struck me that Camp Birkenau lies in a wooded, almost idyllic environment. Any moment you expect a fox running across. I thought that the Polish had let nature return to this area, but also at photos dating from WWII itself you can see that there was a forest here then. There is a very painful picture on display of prisoners among the trees, waiting for their turn to go into the gas chambers. Dark Tourism may be a relatively new trend (the phrase was coined in 1996), but Auschwitz already entered the WH list in 1979 (after having even been proposed for the first list ever in 1978, but then neigbouring Cracow and Wieliczka Salt Mine were given preference). Visiting ‘dark heritage’ is sometimes described as an uneasy mix of disaster tourism and memorial. Auschwitz tends to lean to the latter, it is not as blood heavy as other dark sites that I have visited such as the former Tuol Sleng prison in Cambodia or Saddam’s Red Prison in Iraqi Kurdistan. The displays here are sober, and the total has an understated subtlety. I also appreciate that entrance is free, and there is very little commercial activity around the site. We visited Auschwitz and Birkenau in August 2014. We arrived at Auschwitz early in the morning, because we felt that it is better to visit the camp individually than with a guided tour. From April to October during peak hours (10 am to 3 pm) the visit is permitted only with a guide. Several of the barracks show exhibitions on specific topics or are dedicated to the victims from certain countries or ethnicities. But it is hardly possible to visit all of the them. Most poignant were the rooms with personal items: shoes, suitcases, glasses. But I was even more shocked by the extermination camp in Birkenau, the sheer size of the area is overwhelming. Of course I've seen documentaries and read a lot and I knew about the inconceivable number of people who were imprisoned and murdered here. But it is something entirely different to see the place of these incredible atrocities with your own eyes. In Birkenau, most of the wooden barracks were destroyed or demolished, only the brick chimneys remained, an endless number of them. We inevitably slowed down the pace when we walked along the rail track to the ruins of the gas chambers and on the gravel paths between the barracks, in silence and deep in thoughts. No words to describe my feelings. You should visit both camps to get a complete impression and you should take your time, not only because it is a large area, but mainly because it takes time to cope with all the impressions and emotions. 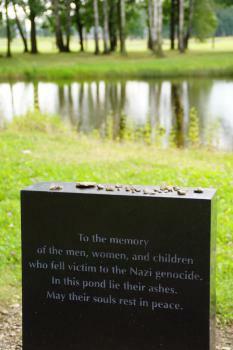 The photo shows a part of a memorial in Birkenau near the the so-called "Sauna" building. It has been argued that sites of unculture like Auschwitz should not be included on a list of cultural and natural treasures, an legitimate opinion. But although I think that the WHC should be very reluctant to inscribe such sites, I think the inscription is justified, because testimonies of the collapse of civilization are also part of the heritage of mankind. Everyone should visit Auschwitz and Birkenau at least once in his life. I visited this WHS in September 2014. This is one of the most touching and horrific WHS I've been too and it definitely deserves its place on the list for mankind to be aware that such atrocities should have never happened in the past and mustn't occur in the future. It is now possible to visit Auschwitz individually only from 08:00-10:00 and 16:00-18:00. Otherwise you'll have to visit with another 25-40 people on a guided visit. Since this WHS isn't an attraction but a site to experience, I believe that the best way to visit is in silence and in touch with your inner self. I arrived in Oswiecim around 8am and there were some parked cars already in front of the Auschwitz museum. However, the place is huge and being able to visit individually means that most of the time you're alone in each section. By the time the group visits start, you'll have to queue to even enter a section which doesn't make sense to me personally. The most shocking experience to me was to see the room with plaits and shaved hair. As the first groups started to flock in, I proceeded to the exit and drove to Brzezinka to visit Auschwitz II Birkenau. This site covers an incredible surface area where unspeakable horrors took place. The gate to hell and railways are worth visiting to experience the sheer size of this place. I'm glad I visited this WHS. Even though we've read, listened, seen quite a lot about the scourge of these concentration camps, we have possibly got used to hearing about it and therefore might not be shocked anymore. Visiting this WHS will definitely be a shocking experience and rightly so. to experience that which cannot be explained! This is truly the most disturbing and terrible place on earth. We need to remind ourselves to which depths we can sink as human beings. It's hard to add anything meaningful to the other posts. This is really an incredible place, and even if you have been to other concentration camps before (like Mauthausen), Auschwitz is on a different scale. Of course you have read and seen a lot about the place, but actually seeing it is quite different. Unfortunately I had no time to go to Birkenau (there are shuttle buses, though), which I think is even more horrific. Definitely a must-visit site. By the way, I think the recent name change proposed by the Polish government to add the "German Nazi" part is a bit strange. Did anybody seriously think it was run by the Poles? To correct one of the previous reviews,Auschwitz is not near Oświęcim. Auschwitz is a German name for Oświęcim, just as Birkenau is for Brzezinka. I live here and I really recommend for everybody to hire a guide as one is not able to understand the history behind the site by oneself (even if you buy one of those thin guidebooks). Of course I do agree that it is not an ordinary site, as you visit it not for enjoyment or appreciation of art but for learning something about one of the greatest tragedies in human history. Unfortunately, not everybody understands that. I've read all the comments did above and I agree with the majority of what is said there. However, I think that everyone if arrive as a normal tourist will in some minutes feel the atmosfere of the camps and will immediately adopt the most adequate conduct. I think that pictures of the site are not only necessary but crucial to tell our friends what we saw there and call their attention to tell them that what happened there was not only the killing of thousands of people. Those who suffered there had a name and picture, and were not only one more person. In our trip to Poland we have seen, near the town of Oświęcim and the village of Brzezinka, the concentration and extermination camps of Auschwitz and Birkenau, the largest in the Third Reich, where the Nazi commanded by Adolf Hitler systematically starved, tortured and murdered 1,5 million people from 24 countries, among them a great number of Jews. It was created by Himmler in 1940 and directed by Rudolf Höss. There are many tragical evidences, preserved in the conditions in which were in 1947, when the museum was founded: fortified walls, barbed wire, electrified fence, platforms, roll call square, sectors of wooden and bricks barracks for men and women with cells and small latrines, deposits for the belongins of the deportees, the Russian graveyard, gallows, false hospitals (wainting rooms to the gas), gas chambers, five cremation ovens, false showers, laboratories for experiments on people, Gestapo camps, entrance gates, railroads, a barrack (work camp for the Russian soldiers) where was for the first time used the gas Zyclon B for extermination, a wall (Death Wall) where were shot 20000 prisoners, bunkers, a barrack where are 70 tunes of hairs, 48000 pairs of shoes, glasses, brushes and dentures. There is also the terrible writing on the entrance arch: “Arbeit macht frei”, that means “The work makes free”. I was really schocked by the tragical evidences of the camp, but it's absolutely worth to be visited for more understing the horrors of the genocide. However I think it don't justifies the inscription because, in my opinion, tragical war places like this (or like Hiroshima or Robben Island) can't be in a list where are inscribed the treasures of the humanity and of the nature. Anyway it represents well all the concentrations camp because it is the most important. I full agreement with the others here, that this isn't a place to be treated lightly. One does get the feeling from some of the displays that the Final Solution was a crime against the Polish people rather than the anti-semetic genocide that it actually was. Nonetheless this does not 'spoil' (for want of better word) what is a heart-wrenching experience. This is a place that everybody should visit at least once in their lifetime. Having recently visited Auschwtiz and Auschwitz-Birkenau, I feel impelled to contribute my own response here. In agreement with previous reviews, I would like to reiterate that this is not a trip or tourist destination to be considered light-heartedly. Many visitors come to the camp, wanting to stroll through and catch a glimpse of the site of such dehumanizing and barbaric acts. This is not something (in my humble opinion) that can be achieved in a matter of hours. If anyone reading this is planning to visit or looking for advice, I would strongly recommend devoting an entire day in order to absorb the full effects of everything here that deserves observing. In my experience, I felt as though I was in a state of semi-shock upon entering the camp(s). I was reluctant to take any pictures. I felt that saving the images of what I saw as a personal "souvenir" of my trip was somehow disrespectful to all of the atrocities that occurred there. In retrospect, I think that if I had spent more time at each of the camps, perhaps I would have overcome such feelings. I now regret not taking any photos personally, not for the purpose of displaying them for others when recounting my experiences, but just for my own memories. Everyone undoubtedly experiences different reactions and feelings when visiting Auschwitz. Those emotions cannot be recreated by hearing the stories on TV, nor by seeing the images on the internet. I strongly urge visitors to make the most of their visits and, yes, even to personalize their visits. A guided tour is definitely worth the time and/or expense. Auschwitz will perhaps be one of the most disturbing and horrific things you see in your life; and yet it is most deserving of being remembered properly. This is not a place that should be visited light heartedly, I was a little distressed to see that some people had come here just as casual tourists; it really is not the place for this type of trip. I visited in both the winter and summer and the difference in temperature is massive, I can not think of living in these conditions (-15° in winter 35° in summer). I would strongly recommend having a guided tour as this gives you an insight to some of the most unimaginable parts of the complex. The Auschwitz area is the most intact part of the site and contains lots of exhibits (rooms full of shoes and hair being particularly poignant), and the only standing charnel house and gas chamber, the absolute horrific sense of the place hit me upon entering here, it was perhaps the most unpleasant feeling I can imagine and took me a long time to get over. The Birkenau complex is a necessity to visit the sheer scale of the area is soul destroying. This part of the camp was built for one purpose, and this can be crippling when you view the vast compound. It seems like a huge machine designed for the most ruthless and efficient process of murdering people. The site can be reached easily from Krakow via Oswiecim station and there are buses to Auschwitz from there (it is possible to walk) Birkenau is a little further on you will probably be able to quite easily pick up a taxi to make the short transfer there. Nothing can sum up the scale and effect this place had on me and I am sure has had on almost every one who has seen it. Don't treat a trip to Auschwitz like you would a trip to any where else on the UNESCO list. this was a truly horrific journey and one which should not be taken lightly. the order of the Auschwitz complex and the sheer massive scale of Birkenau. The site achieves the utmost respect from every visitor. It is worth getting a guided tour as this gives much more information. Visits at different times of the year will give you a view of the different features of life in the camps from the bitter winter conditions to the blistering heat of summer. the station is Oswiecim and is on the line from Krakow, the main camp is a short walk/bus ride from the station and the birkenau complex is further out, best to have a short taxi ride. This is not a tourist destination and is geniunly the most Harrowing place imaginable. From "Auschwitz Concentration Camp" to "Auschwitz Birkenau. German Nazi Concentration and Extermination Camp (1940-1945)"
Modern Oswiecim has a train station with easy connections to Cracow. Auschwitz I is walkable from the station in about 20 minutes. There are shuttle buses to Auschwitz II from there. Vistula: Located along the Sola River, a tributary of the Upper Vistula River. 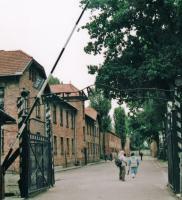 Places of Execution: Gas Chambers and "Execution yard"
LGBTQ culture: Whilst the UNESCO Web site description refers only to the death of Jews, Roma, Sinti and "prisoners of several European Nationalities" the Nazis also persecuted Homosexuals and such prisoners transported there were subject to particular degradations. 335 Community Members have visited.